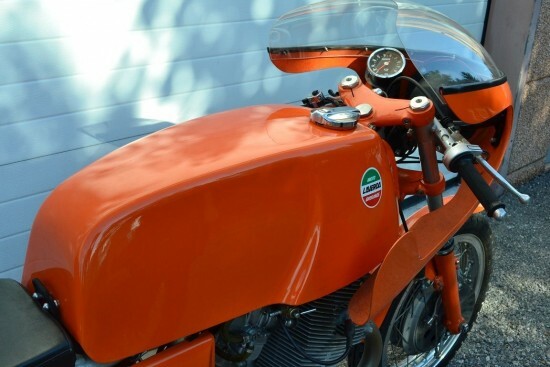 Laverda’s fierce homologation SFC was powered by a tuned version of their nearly bulletproof parallel-twin and was available in any color you wanted, as long as it was orange. You know, as good-looking as Ducatis are in red, and as classic as old British bikes are in black or silver, there’s something undeniably cool about a company choosing a “factory” color so incredibly in-your-face, so polarizing. Kawasaki’s green isn’t the prettiest color, and it isn’t always flattering, but you damn well know which manufacturer made that lime-green plastic rocket, sitting across the street. Relatively unstressed in roadgoing form, the twin was capable of much more power, and the SFC was tuned to make almost 80hp. 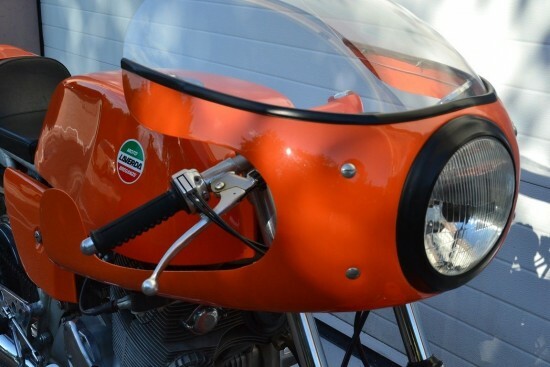 Given its rugged nature it’s no surprise that the bike performed well in endurance racing: many SFC’s come with their headlights lights and turn signals boxed up and unused. 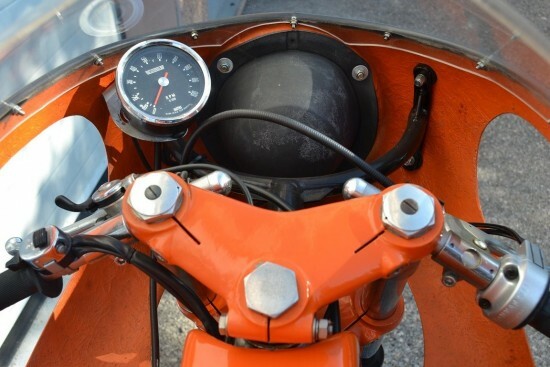 I love that the dash on this bike contains exactly one instrument: a tachometer. No oil temp gauge, certainly no speedo. No idiot lights, not even a dash panel. Just that one Smiths gauge hanging there behind the headlight bucket. 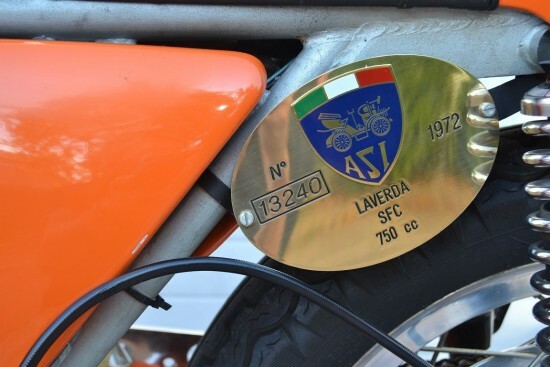 Bike in top conditions, mechanically rebuilt by main specialist Riccardo Oro (documented), present on the Laverda SFC register with extra certification by Massimo Borghesi, last owner since 1997. Italian documents. 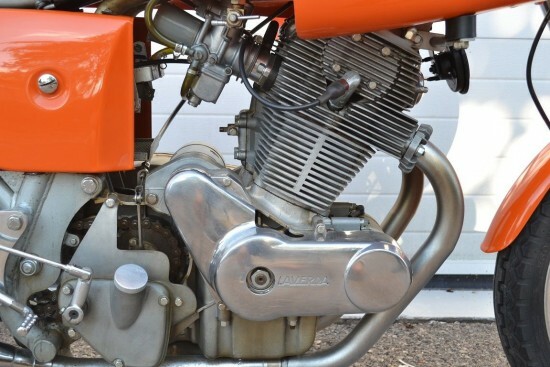 The listing doesn’t mention it, but the bike also appears to include a crudely-welded, but probably period-correct 2-into-1 exhaust: because that’s just how racebikes roll. 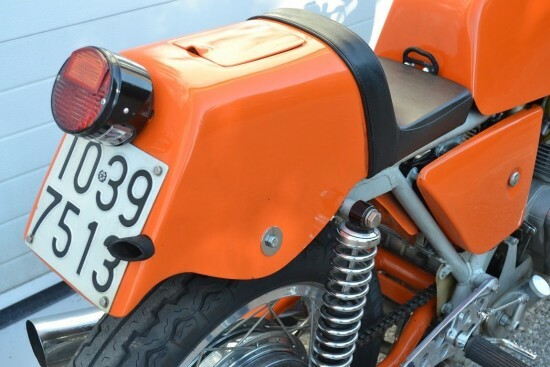 The seller Gianluca has listed a number of very tasty motorcycles for sale in the past and mentions that the bike is currently in the UK, but he’s happy to ship anywhere in the world. 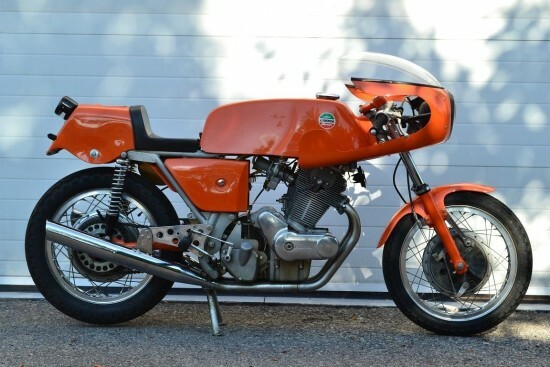 Bidding is up to almost $20,000 with plenty of time left on the auction and I’ve no doubt it will go much higher: with under 600 ever made, these are some of the most desirable motorcycles of the era with rarity, pedigree, and that exotic, sadly defunct “Laverda” nameplate. Which explains, not, why the first photo shows a 2-into-2 exhaust. The 2-into-1 is shown in a separate photo and isn’t currently installed. I’ve seen a few Laverdas with a similar setup, but I’d be curious to know more about this exhaust.